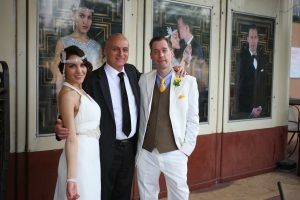 From the moment Reverend Steve Trahan of Sensational Ceremonies walked up to the Lakewood Theater in Dallas TX he could tell this wedding would be one of a kind. The theater, built in 1938 has a unique charm instantly transporting anyone in its presence back to an age long ago. But, on May 17, 2014 it was revived as Jake and Gabrielle chose this unique venue to celebrate their wedding day. Dressed as though the decade was the 1920’s Jake and Gabrielle looked stunning, and every photo taken bursts with the romance and rebellion of the era. Jake looked sharp in his white suit and Gabrielle was stunning in her gown accessorized with the perfect touch of glamour. And while the bride and groom were very much the stars of the show, the guests were ready to play their part as well. Most of them were adorned in 1920’s attire, and carried an unusual excitement and anticipation that foreshadowed a unique wedding ceremony. The bright lights of the theater were turned on as Rev. Trahan walked onto the stage. Then it was Jake and Gabrielle’s grand entrance. As they walked onto the stage their unique ceremony began. With a sincere love for one another they recited their personally written vows. As Jake spoke to his bride the sincerity of his words filled with room. He expressed his heart tenderly as he looked into the eyes of his bride to be. Gabrielle then spoke words of love from her heart to Jake. Her words carefully chosen and were very heart felt as she looked into the eyes of the one she had chosen to spend her life with. As they were pronounced husband and wife their family and friends cheered with enthusiasm. Truly, a one of a kind wedding.